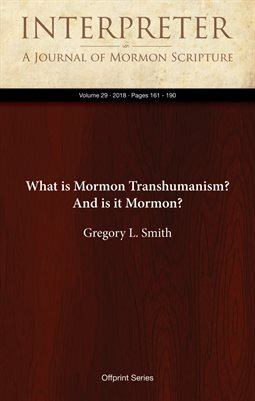 Abstract: Some sources have described Mormonism as the faith most friendly to the intellectual movement known as Transhumanism. This paper reviews an introductory paper by the past President of the Mormon Transhumanist Association. A syllogism that purports to show that Mormonism is compatible with — or even requires — Transhumanism is analyzed. The syllogism’s premises are shown to misunderstand or misrepresent LDS scripture and doctrine. The proffered Transhumanist conception of “human nature” and the perspective offered by LDS scripture are compared and found to be incompatible. Additional discrepancies between the Transhumanist article’s representation of LDS doctrine and the actual teachings of LDS scripture and leaders on doctrinal matters are examined. The article does not accurately reflect LDS teachings, and thus has not demonstrated that Transhumanism is congenial to LDS scripture or doctrine.